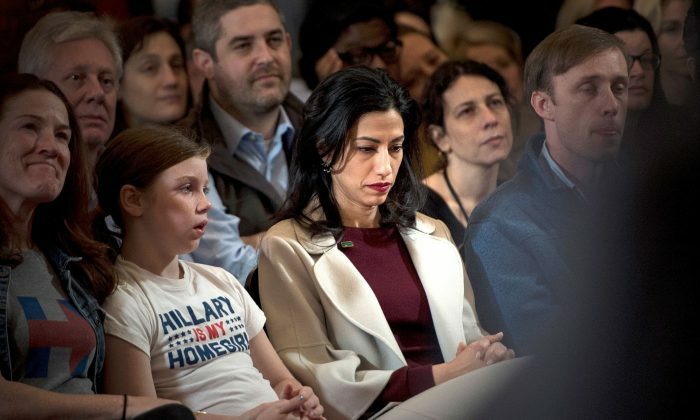 Former Hillary Clinton campaign adviser and aide Huma Abedin has been blamed by several other unnamed campaign insiders for Clinton’s election loss to Donald Trump, reported Vanity Fair. According to the report, Abedin received backlash after FBI Director James Comey’s announced that he would re-investigate Clinton’s email server around 10 days before Election Day. In a letter to Congress, Comey said the FBI had found new emails from Clinton on the personal computer of Abedin’s estranged husband, scandal-ridden former congressman Anthony Weiner. Abedin apparently shared the computer with Weiner. The weekend before the Nov. 8 vote, however, Comey announced his agency didn’t have enough evidence to go ahead with a renewed investigation—but the damage was already done to Clinton’s campaign. “Maybe I’m just pissed off, but I really don’t give a [expletive] about what happens to Huma to be honest with you,” a close adviser to Clinton said in the magazine interview. Another Clinton adviser noted that Abedin and the circle of people around the Democratic candidate “suffocated” her and prevented the campaign from taking advice from outsiders, Vanity Fair reported. The Vanity Fair article did not elaborate on who those other people in her circle were. Following Comey’s letter, Abedin has largely remained out of the spotlight, and after Election Day, she’s been missing from most of Clinton’s scant public appearances. It’s unclear if she’ll appear with Clinton for the campaign’s party for donors on Thursday night. Regardless of how former Clinton staffers feel about her, Abedin is “someone that will be sought after either personally or through business from many rich, very rich connected people … She’ll do very well for herself,” another source said.